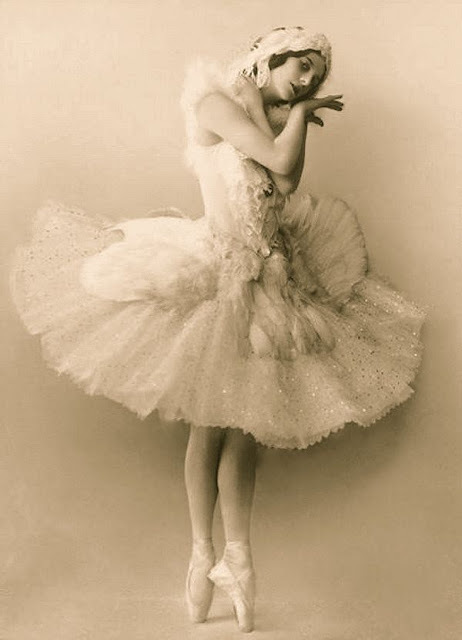 Anna Pavlova, was considered the greatest ballerina of her time. She was a dancing sensation across America, Europe, and the UK in 1911. It is believed that at that time a dessert was created in homage to her, a light, airy dessert called 'Strawberries Pavlova'. It was a marriage of a delicate crisp meringue, sort of like the tutu she is wearing in the photo, with a soft sweet marshmallow center. It was then served with sweetened whipped cream and topped with fresh strawberries. Other countries like Australia and New Zealand also claim to have invented this beautiful dessert, using kiwi fruit, strawberries, blue berries and other fresh fruit as a topping. 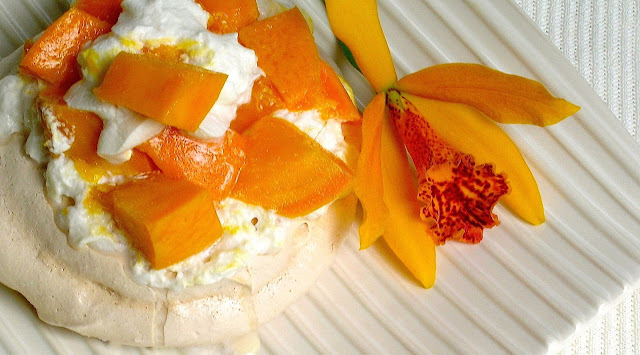 To my knowledge, Anna Pavlova never visited Hawaii, so I created a tropical version of 'Pavlova' using local Hawaiian Mango. It has a crispy meringue shell that is filled with sweetened whipped cream. It is then crowned with slices of sweet fresh mango. The whole thing is then drizzled with fresh lilikoi (passion fruit) pulp, creating a crispy sweet, yet tangy dessert that's easy to make. Preheat oven to 300˚F. Line a baking sheet with parchment paper. Draw 6, 3-inch circles on the parchment paper. In a large bowl, beat egg whites until stiff but not dry. Gradually add in the sugar, about 1 tablespoon at a time, beating after each addition. Beat until thick and glossy. Blend the vanilla, cornstarch and lemon juice together, gently fold it into the beaten egg whites. With a large spoon, scoop the mixture inside the circles drawn on the parchment paper. Working from the center, spread mixture toward the outside edge, building up the edge slightly, leaving a depression in the center. Bake for 1 hour, then turn the oven off and let the meringues cool in the oven for at least 1 hour, but overnight is better, with the door left ajar. In a small bowl, beat heavy cream with powdered sugar until stiff peaks form; set aside. Remove the paper, and place meringues on serving plates. Fill the center of the meringue with whipped cream, and top with mango slices topped with fresh passion-fruit pulp, with or without the seeds. Serve immediately! Note: Use room temperature eggs whites that have absolutely no yolk in them when broken. For more information about the history of this dessert, click here. A Tropical Dessert For Mango Lovers!